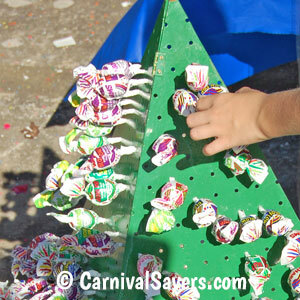 Carnival Game Idea - DIY Lollipop Tree! Sturdy Base for a Handmade Wooden Lollipop Tree. Tree Above is Made from Pegboard in a Pyramid Shape. There are many ways to make a homemade lollipop tree and they can come in many different shapes and sizes too! For the top image above, a volunteer skilled in woodworking would design a tree shape and cut the shape with woodworking tools out of the piece of plywood. Next, the volunteer would design a stand that would enable the tree to stand upright (with a slight lean) and be stable as to not fall over with a gust of wind. Then, the holes for the lollipops will need to be drilled (you want them large enough to accommodate the stick of the lollipop without being so large that the pops slide out. 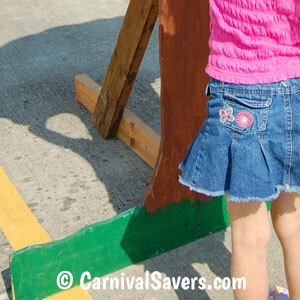 Finally, the tree is decorated with the paint and allowed to completely dry before being used for the carnival. If using a Peg Board, we have seen triangular pieces of pegboard being attached in a pyramid shape, and painted to be a small tabletop lollipop tree. You can also cut it into a shape and set up as frame as above, just keep in mind that pegboard is a little flimsy and so the size of the tree is typically smaller or needs a very sturdy frame for the edges if you use pegboard. 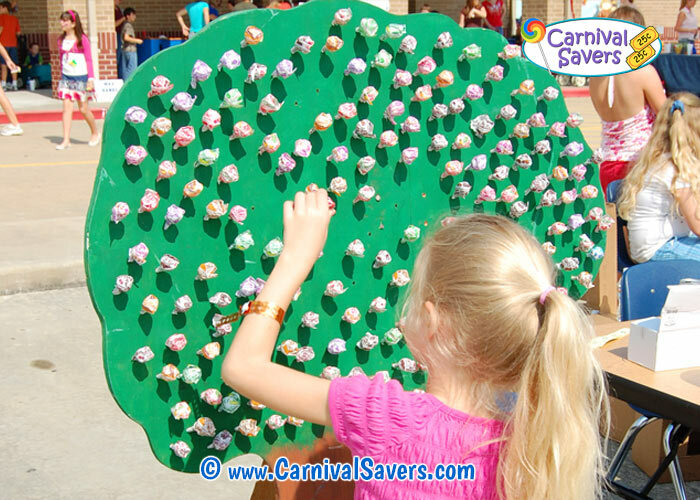 Note: We also sell a cardboard lollipop tree that sets up in minutes and holds about 400 suckers - if you are running out of time to make this game for your event! Before the carnival, count the number of top or medium prizes you are have chosen for this booth. 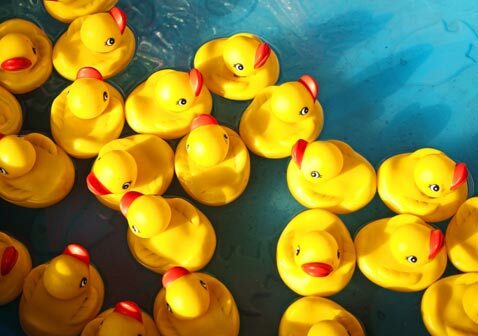 For example, lets say you chose to give away 48 Ice Cream Cone Shooters as the medium prize and 24 Stuffed Animal Long Armed Apes as the Top Prize. You mark the end of 48 lollipop sticks with red coloring and mark the end of 24 of the lollipops with a blue color. Make sure the marked lollipops are evenly mixed in with the unmarked pops. (Top carnival prize winners should be about 10% - 20% of all players). Each player chooses a lollipop from the lollipop tree. Every player gets to keep the lollipop they choose! But, (in keeping with the example above), if the lollipop has a red mark on the end of the stick, then the player gets to keep the lollipop they picked AND an Ice Cream Cone Shooter. If a player chooses a lollipop from the tree and it has a blue mark on the bottom of the stick, then the player gets to keep the lollipop and they will also be awarded a Long Armed Ape as they won the top prize! This is one of those carnival booths we have seen folks really goof up! If you have a "just for fun" carnival, and you are not taking tickets for this booth, be sure to tell kids that they are allowed to choose one lollipop only! We have seen if this game is run without tickets, the kids will pull lollipops until they find a winning color at the end of the stick unless they understand that they are allowed one lollipop per turn. Note: It is a fantastic idea to hold some of the marked lollipops for later in your carnival so all of the winning suckers are not chosen before your event is over! SWEET TREATS for YOUR HANDMADE LOLLIPOP TREE GAME!